Since March 25, 2005 the Carbon Truss 16 inch f/9 Ritchey-Chretien telescope, with ion milled optics, has been installed and operational. 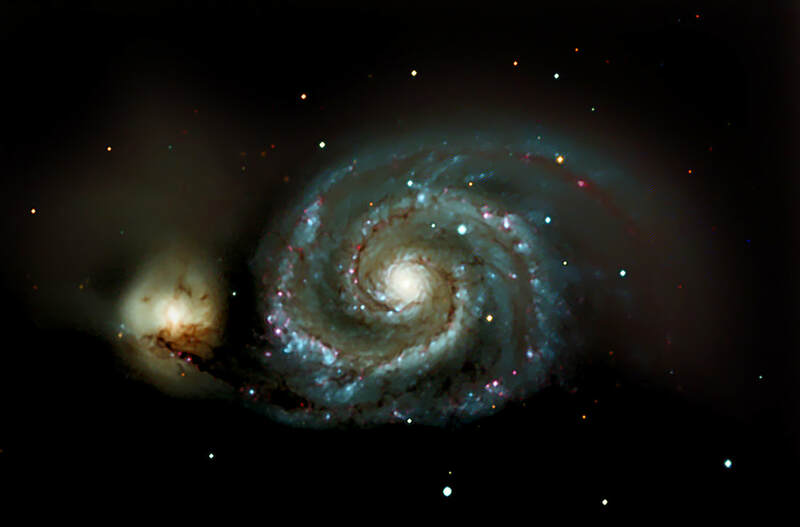 Detailed information regarding the system, including the Software Bisque Paramount ME equatorial mount and CCD imaging systems, can be found on the "Lost Valley Observatory" link. I generally image with the telescope at 'prime', with a 3685 mm FL. Using the current SBIG SLT-6303 cameral this puts me at an image scale of 0.51 arc-sec/pixel with a generous FOV of 17.3 x 26 arc-min. 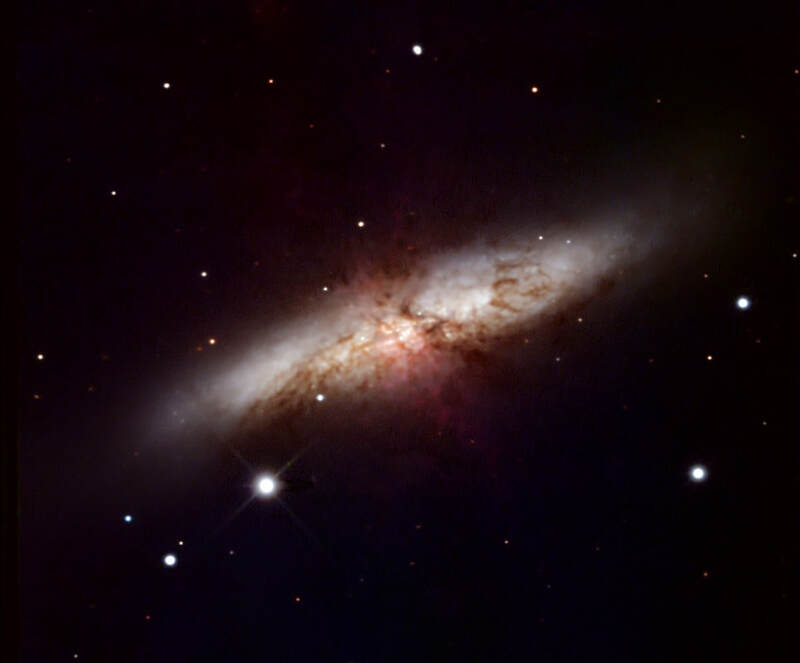 The "first light" image is of M82, and and was taken prior to telescope collimation, periodic error correction or even T-point modeling. It was, essentially, and "out-of-the-box" (or should I say "out of the hundreds of boxes...") image. My images are listed sequentially, hopefully improving with time and experience. It is intentionally arranged this way, as opposed to a standard astro-image gallery with galaxies, nebula and planetary images separated. There are brief notes describing new techniques and errors (click on the image to enlarge to it's full size..or at least to the largest size I felt could be tolerated for a particular image). The advantage of this type of chronological gallery is one can see the progression of experience and learning curve (with all the expected errors)...the disadvantage is it's more difficult to "find" a particular image (as they're not arranged by catagories but rather show up as I find an interest in imaging them). This first light image from the RC-16 was shot on a hazy moonlit night. This is M82 in Ursula Major, a favorite of many astrophotographers because of the unusual characteristics eminating from the center of this edge on spiral galaxy. This was imaged with an SBIG ST-10XME and A0-7 at prime (f/9). An LLRGB image (6x10 minute exposures of L, R. G and B). Images aquired with CCDAutopilot II and CCDSoft. Processed with Maxim DL, Adobe CS and deconvoluted with AIP. Deconvolution significantly improved the "relative" seeing to approximately 2 arc-sec/pixel (FWHM of 6.00 pixels, image scale of 0.38 arc-sec and 'rough' conversion factor of 80% gives 6 x .38 x .8 = 1.84 arc-sec). Of note, this image was taken before the RC-16 was properly collimated. This image was dissapointing, and I have posted it for just that reason. This was imaged with an SBIG ST-10XME and A0-7 at f/6. Although the original image was performed with 8 separate 10 minute images (LRGB), only 3-4 images were usable due to technical errors, clouds obscuring some images and a series being shot after dawn. It was assembled as an LLRGB image (only 3-4 x10 minute exposures of L, R. G and B). Images aquired with CCDAutopilot II and CCDSoft. Processed with Maxim DL, Adobe CS and deconvoluted with AIP. Lesson Learned: You can only push the limits of processing when you have the data to support it. On the other hand, I was amazed to get even this much from the poor data available. I saved what I could by being careful NOT to overprocess, as evidenced by the lack of any "burn-out" of the core (though some overprocessing was necessary with color saturation and unsharp masking towards the end, as is unfortunately evident). Another image which just couldn't be worked any further. 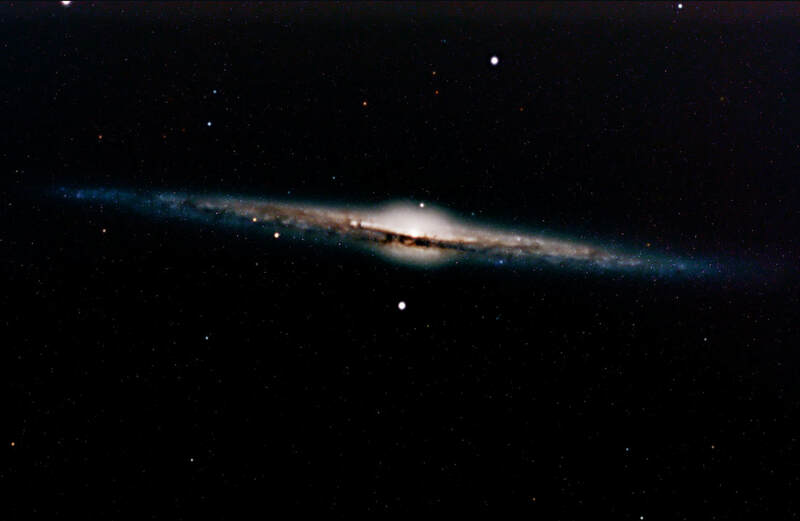 Thisnis NGC 4565, a stunning edge-on spiral galaxy in the constellation of Coma Berenices, some 31 million light years distant, with a length of 125,000 light years. Theres a beautiful "dust" lane which covers about two thirds of its' length. This is an LLRGB image of 6 separate 10 minute guided exposures using the AP 0.67 FLR. Images captured with an SBIG ST-10 XME and guided with the internal autoguider. Image aquiition with CCD AutoPilot II. Processed with Maxim DL and Adobe Photoshop (KBQ, April 2005). Lesson Learned: On a positive note, the stars are beautifully round. On the other hand, this is a composit of an too few images under less than ideal cky conditions. Although the detail surpasses any previous attempts, on my part, at this galaxy, there is a stunning lack of faint background galaxies and the image is somewhat grainy. The cause is due to a number of issues including poor flats and the need for more images (ie, increase the signal to noise ratio). The REAL lesson here is to spend more time on fewer images. This is VERY difficult for anyone, such as myself, who still is in the early stages of this "hobbie" (or is that "obsession"). It is very tempting to image new objects. Despite the technical flaws which arise from this approach, the delight in imaging many galaxies sometimes overwhelms the desire to image a few well. Now that I've got some of this "out of my system" with this remarkable telescope, I plan to collect more data PRIOR to processing. This was an attempt during a full moon with a great deal of humidity. The green gradient, most pronounced on the right, and the green halo around the stars, resulted from these conditions. The "seeing" was 3.51 arc-seconds (AIP calculated FWHM of non-saturated stars was 6.89 pixels and the image scale, at f/9, was 0.51 arc-seconds/pixel). With Richard-Lucy deconvolution the FWHM improved to 2.7 arc-seconds, for an adjusted "seeing" of 1.37 arc-seconds/pixel. Nonetheless there is a horrible greene cast which I was only partially able to remove with Maxim's gradient removal tool, the New CCD Astronomies dradient tool removal and the use of Adobe Photoshop CS (others are much more expert at doing this, and it will be a new goal of mine to learn). This is an H-alpha/Clear-RGB image of 18 separate 2 minute guided exposures. Images captured with an SBIG STL-6303 and guided with the internal autoguider. Image aquiition with CCD AutoPilot II. Processed with Maxim DL AIP and Adobe Photoshop (KBQ, June 21, 2005). The "Luminescence" image was a 60%-40% layering of the Ha and Clear filtered images (assembled in Adobe Photoshop). Combining the H-alpha and Clear images seemed to cause less color distortion than combining the Ha and Red images. Lesson Learned: Imaging during a full moon in a hazy/humid sky is going to result in a significant gradient. Trying to remove this gradient will diminish the signal to noise ratio, resulting in what is shown here. Others have found more effective ways to deal with these gradients and it's worth the time to learn their techniques. As an example, I doublt anyone can see any gradients in Dr. Robert Gendler's images, most of which were shot over lighted suburban skies. 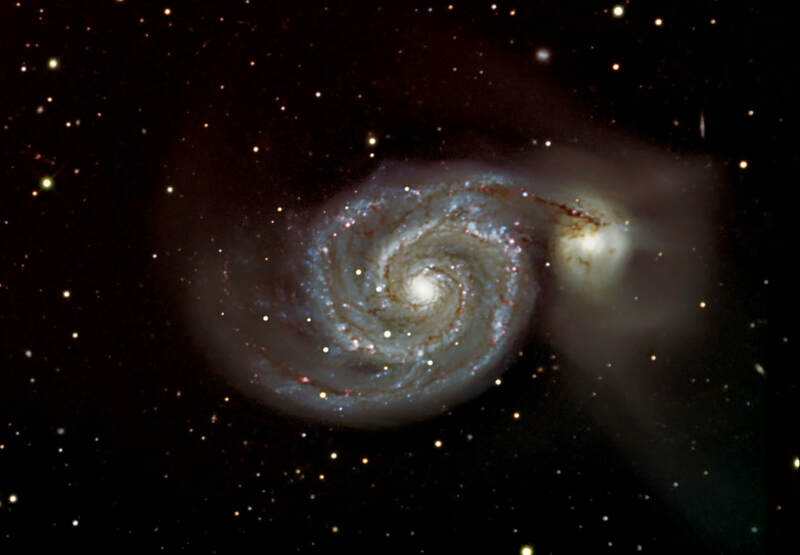 A revisit with M51. This time around the image was taken with a Class I SBIG STL-6303XME. There were approximately 16 separate 15 minute images taken with the L, R, G and B filters; for a total expoure time of 16 hours. The image was assembled as an LRGB image. Images aquired with CCDAutopilot II and CCDSoft. Processed with Maxim DL, Adobe CS and deconvoluted with AIP. Lesson Learned: The increased amount of data and improvements in data processing "helped" improve this image. The telescope was not properly collimated when this image was taken, and it is hoped that the next series will show even greater detail. Prior to deconvolution the seeing was about 3.5 arc-seconds with a 'percieved' post-deconvolution improvement to about 2.3 arc-seconds. 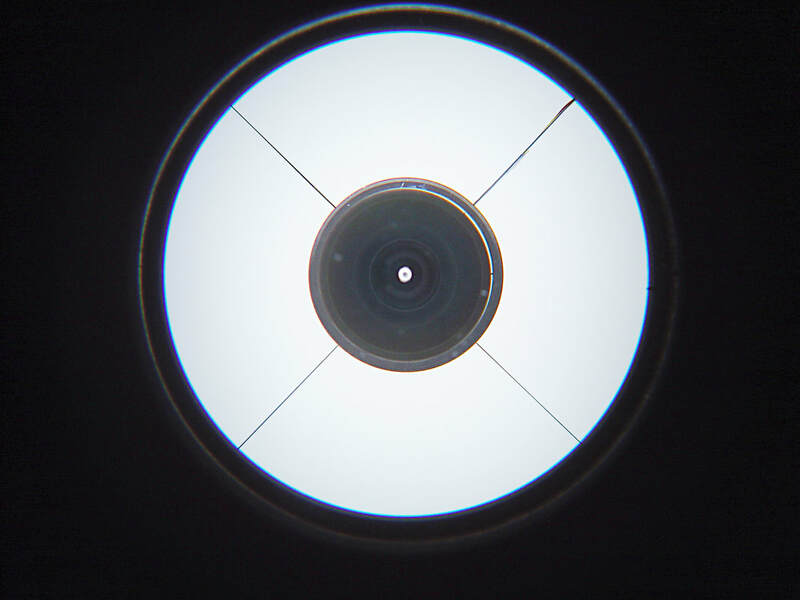 After looking closely at the previous image I suspected that the collimation might be off. In fact, a check with the Takahashi Collimating Scope showed this to be the case, as can be seen above. The primary mirror required a slight tip/tilt for correction. Details on how to perform this is in the users guide at the RCOS users website. The primary is adjusted after centering the secondary, which was also out of allignment. The primary mirror error is corrected, with the baffles now looking like concentric rings. These images were taken by simply aiming my Sony CCD camera down the barrel of the Takahashi Collimating Scope. Prior to correcting the primary mirror the secondary has to be allligned. 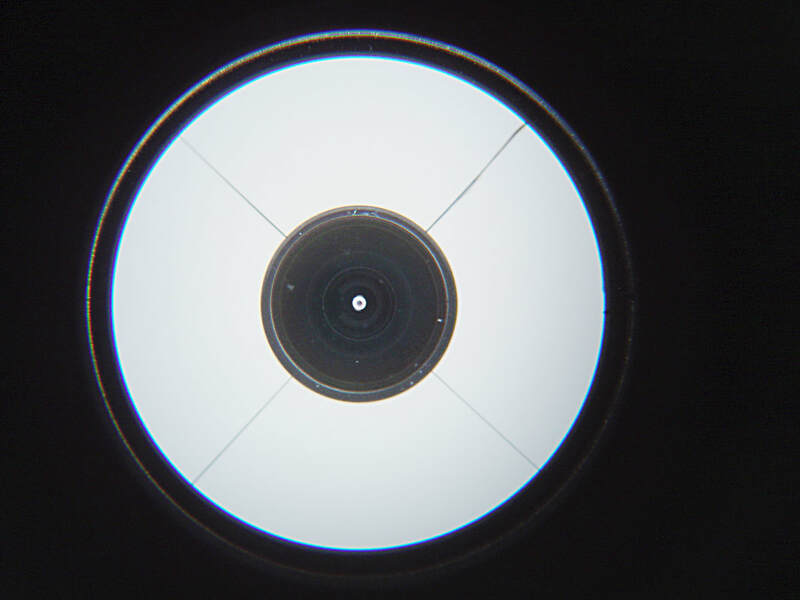 This image shows that the center of the secondary mirror is NOT centered in the Takahashi Collimating Telescope. 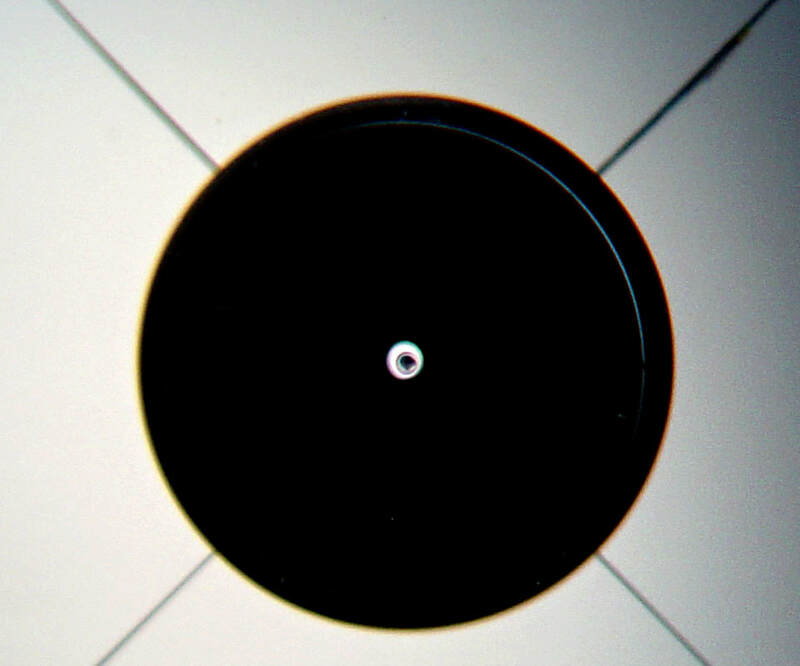 The central irregular mark with the circle around it is the felt tiped marker region (made in the exact center of the secondary mirror) This image was taken BEFORE the primary mirrors were collimated, and therefore the primary collimation error is still visable. 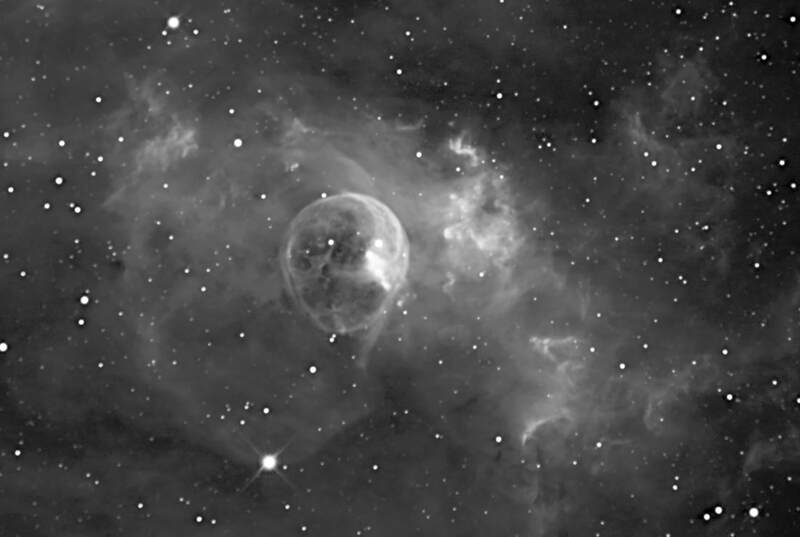 The Bubble Nebula, or NGC 7635 in Cassiopeia. This is a 30th magnitude emission nebula is known for it's distinctive "bubble-like" appearance. Imaged with an SBIG STL-6303 in H-alpha only. Twelve separate 15 minute images calibrated and registered with MIRA AP, deconvoluted with AIP and processed with Adobe Photoshop CS. Imaged under typical irratic New England Skies with an AIP4WIN Star Tool FWHM value of 6.7 pixels prior to deconvolution and 2.1 pixels following deconvolution. With an image scale of 0.51 ASP this gives and inital (approximated) "seeing" of 6.7 x .51 = 3.41 arc-seconds (by my "eye", a very generous estimate considering the imtermittant cloud cover). KBQ, July 30, 2005. 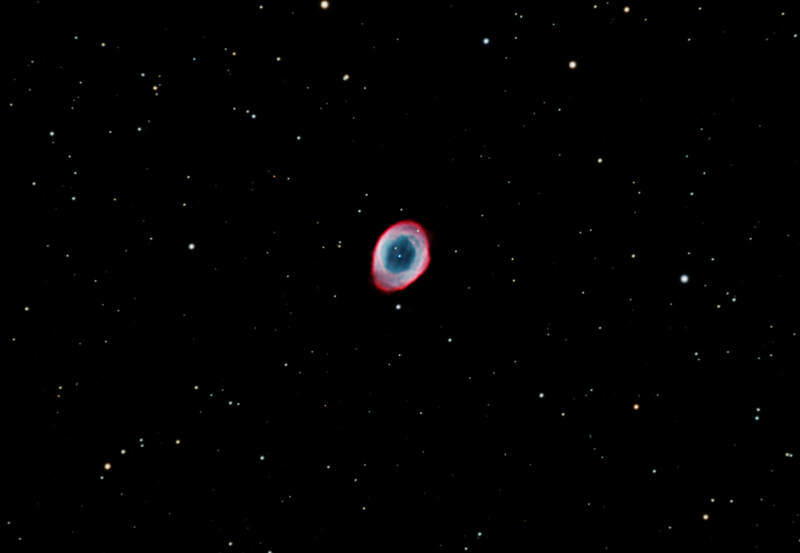 Thr Ring Nebula, or M57 in Lyra. A 9th magnitude planetary nebula about 2,150 light years distant. The central 15th magnitude star is clearly visable in the center of the nebula. Imaged with an SBIG STL-6303 using CCD AutoPilot II. Five separate 15 minute images processed as an LLRGB image. Calibrated and registered with MIRA AP, deconvoluted with AIP and processed with Adobe Photoshop CS. Deconvolution with AIP made a remarkable difference in the "appearance" of the small stars within the nebula. The AIP measured FWHM changing form 5.50 pixels (5.5 pixels x .51 arc-sec/pixel = 2.85 arc-sec seeing, as an estimate) to 2.26 pixels ( about 1.15 arc-sec of seeing, again, only as an estimate). KBQ, August, 2005. 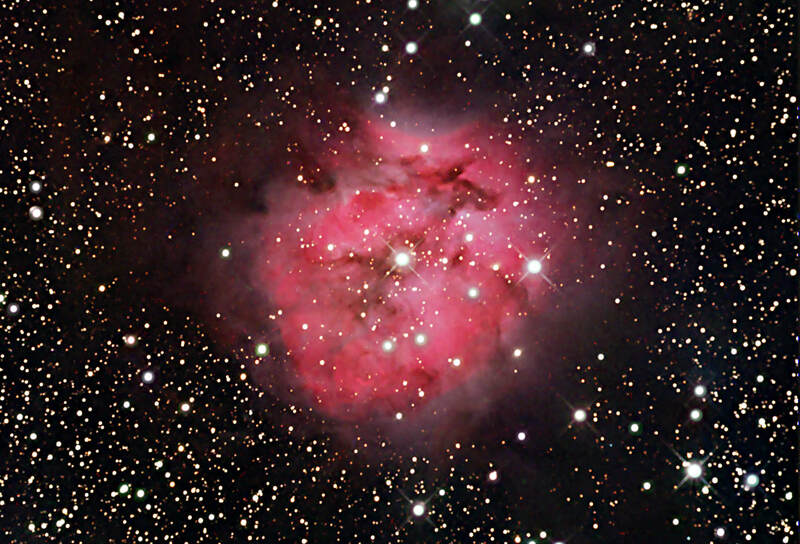 Cocoon Nebula (IC 5146) in Cygnus. 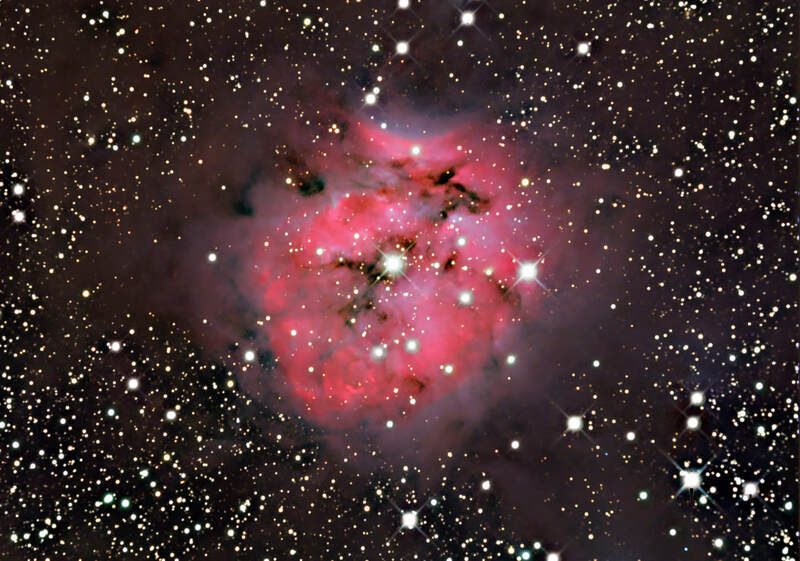 This is my first shot at the Cocoon Nebula, unfortunately on a typical poor night in New England. Many of the frames had to be deleted due to clouds. The next few images will be done with specific goals in mind: 1) Obtain a better quality Cocoon Nebula, 2) Shoot several hours of H-alpha for both the Ring Nebula and Cocoon Nebula, in order to bring to outer layer of expanding ionized hydrogen in the image and 3) Image the Viel Nebula (haven't had the pleasure yet!). As for this image: Imaged with an SBIG STL-6303 using CCD AutoPilot II. Six separate 15 minute images processed as an LRGB image (6 hours of exposure time; H-alpha shot but not used in this image). Calibrated and registered with MIRA AP, deconvoluted with AIP and processed with Adobe Photoshop CS. KBQ, August, 2005. 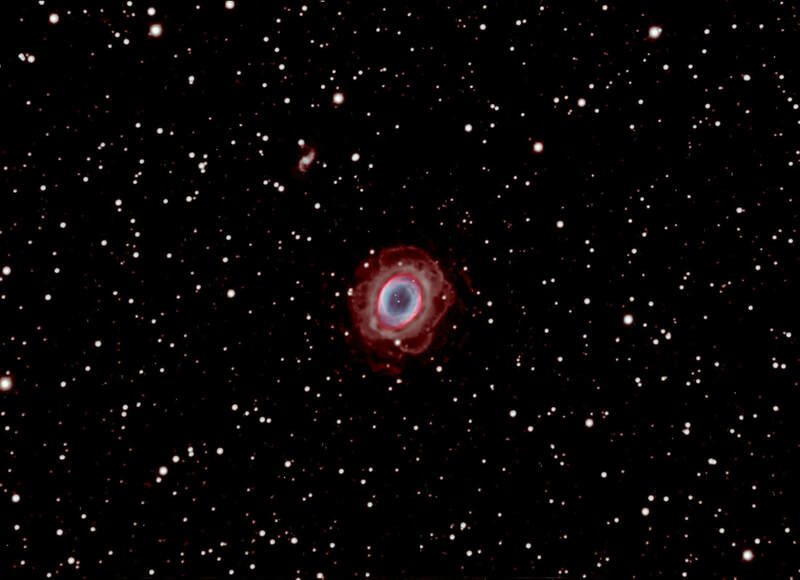 The previous image of the Ring Nebula was here superimposed, with Adobe Photoshop CS, onto a series of 30 separate 15 minute H-alpha exposures (7.5 hours of H-alpha imaging). Used the pinlight option. The H-alpha images were pseudocolorized in Adobe. The overal quality of the "ring" is quite good, but the surrounding quality, including the outer ring, is less than optimal (note the bluring of the small adjacent galaxy). Increased imaging time to improve the signal to noise ratio would improve on this, but I just don't have the time !! Another problem, the stars have internal dimples, due, I believe, to a bit of overdoing the deconvolution step with AIP4Win. Imaged with an SBIG STL-6303 using CCD AutoPilot II. Six separate 15 minute images processed as an LRGB image (6 hours of exposure time) with 7.5 hours of H-alpha superimposed. Calibrated and registered with MIRA AP, deconvoluted with AIP and processed with Adobe Photoshop CS. KBQ, September 3, 2005. The weather in Maine has been awful...and the "seeing" (based on a FWHM of 8 pixels and an image scale of 0.51 arc-seconds/pixel) has been about 4 arc-seconds/pixel (versus the Florida and west coast seeing of 1.5-2 arc-seconds/pixel). Deconvolution brought this down to about 3 arc-seconds/pixel (FWHM of 6 pixels). The data was obtained over 3 nights with about 14 hours of useful data collected. The object is a very dim Messier object and I should have imaged it on a better series of nights (which would mean waiting for the earth to tilt another 15 degrees !!). I was VERY careful NOT to overprocess this image, as it was a total disaster each time I did. The final result was a real disapointment, though that could have been predicted from the weather conditions. The problem is one of less than optimal detail and contrast (I was lucky to get as much as I did out of this data). Perhaps some of this could be made up for by doubling or tripling the number of exposures (increase the signal to noise ratio), but I'm on to new objects.... Imaged with an SBIG STL-6303 using CCD AutoPilot II. About fourteen separate 15 minute exposures for each of the L.R.G,B filters obtained and processed as an LRGB image. Imaged with CCDAutoPilot II, calibrated and registered with MIRA AP 7.0, deconvolution with AIP and processed Maxim DL and Adobe Photoshop CS. KBQ, November3-15, 2005. 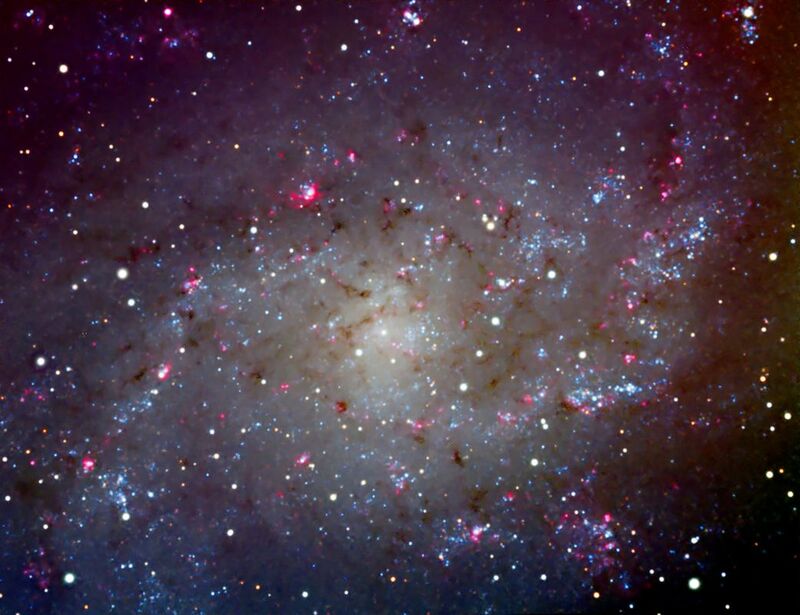 This is a view of the core of M33. 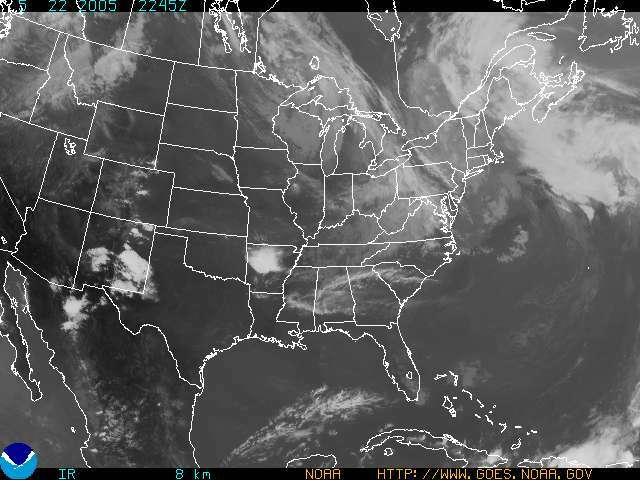 Seeing conditions were at about 3.5 arc-sec/pixel and deconvolved to about 2 arc-sec/pixel. 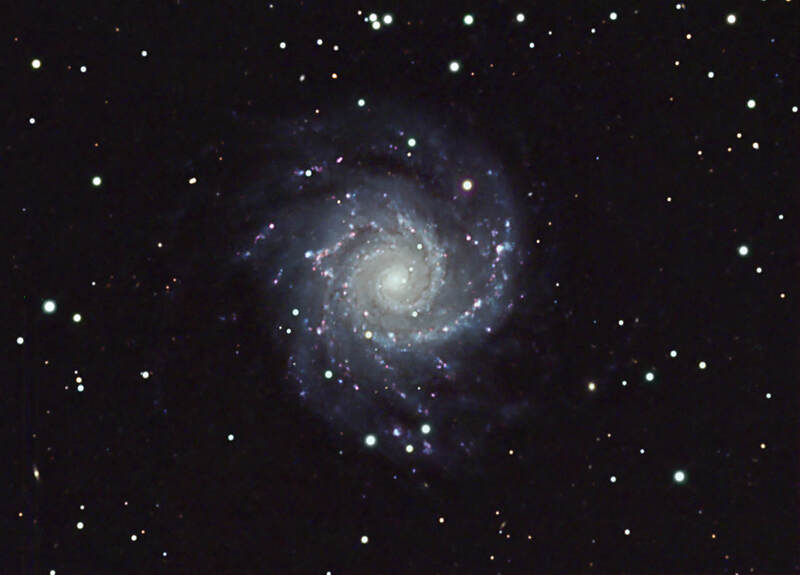 This image is less challenging than M74, haivng a greater surface brightness. The weather was not entirely cooperative (whats new). A Change in technique ? : I will be increasing the time of my R, G and B components of my images dramatically, in order to improve the color Signal to Noise ratio (removing some of my reliance on the luminance images for image resolution). Biology and CCD imaging diverge on this subject. Visual acuity is largely due to closely packed cones (color receptors) in the fovea centralis of the eye. The black and white perceiving rods are more suited for detecting motion and seeing in low light. Nonetheless, with CCD imaging, the Luminance or Clear filters are responsible for the "detail" or "resolution" of our image (as you don't loose much of the 'light' as happens with the colored filters). The color filters bring in 1/3 as much light as our clear filters and so are often binned to make up for this. By binning we also get less readout noise. One way to "make up" for this problem is to simply shoot more RGB images. This improves the signal to noise ratio of the colored components of the image. From my perspective, this is the best way to approach the problem. The only down side is the time needed to take these images !! Imaged with an SBIG STL-6303 using CCD AutoPilot II. About fourteen separate 15 minute exposures for each of the R.G,B filters and 40 separate 15 minute L frames obtained and processed as an LRGB image. Imaged with CCDAutoPilot II, calibrated and registered with MIRA AP 7.0, deconvolution with AIP and processed Maxim DL and Adobe Photoshop CS. KBQ, December 28, 2005. During our December 2005 Star Party, the RCOS-16 was aimed at Neptune for the first time. A single RGB image was taken with the STL-6303. I have never imaged Neptune before, and questioned whether I was looking at a slightly blue star, or at Neptune. 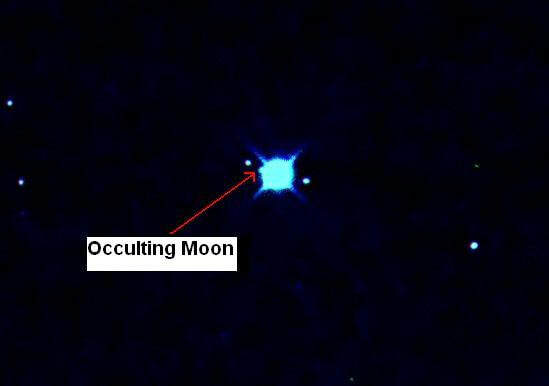 When we zoomed in on the image an obvious occultation was seen. The arrow marks the occulting object (possibly a moon) in the upper left hand corner (at about 2200). It could be a star, though this is unlikely in view of the other 4 objects (presumably 4 other moons) seen within the same (orbital) plane. One of these days I'll aim the ToU Camera at Neptune and try to get a better 'quality' image of the planet. This supernova remnant, found in the constellation Taurus, is a favorite of amateur astronomers. 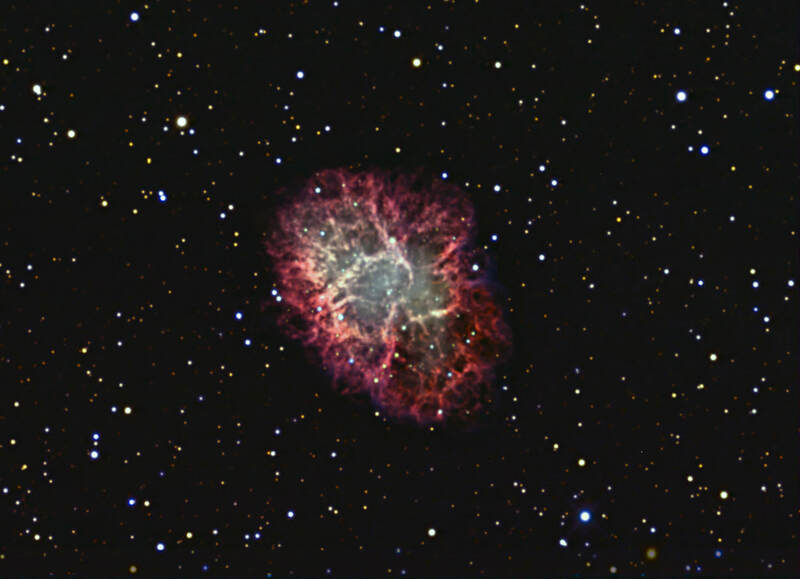 The supernova event was recorded by the Chinese in 1054 AD, and was actually visible during the day. 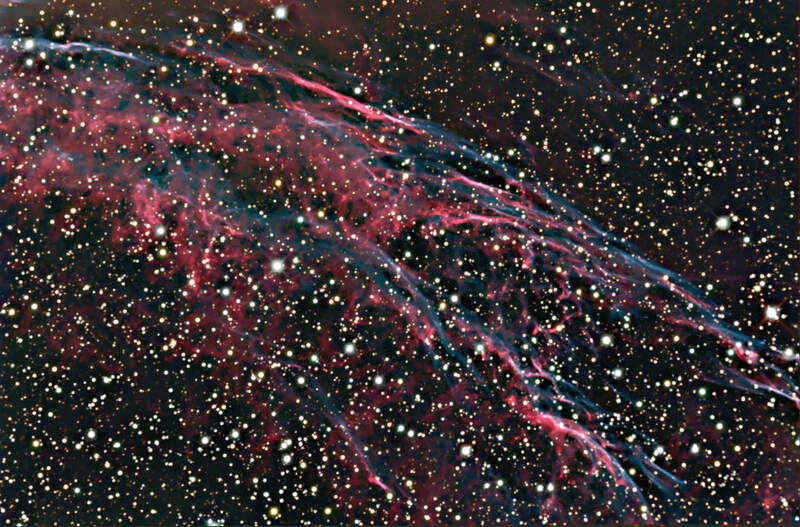 Unlike the Veil Nebula, this one occurred relatively recently and therefore has maintained some remnants of a "shape" (which will not last for long as it is expanding at over 1000 miles/second. There is a rapidly rotating star neutron star (pulsar) at its core. Imaged with an SBIG STL-6303 using CCD AutoPilot II. About fourteen separate 15 minute exposures for each of the L.R.G,B and H-alpha filters obtained and processed as an H-alpha/L'R'GB image. The L' image is a 70% Luminance image combined with a 30% H-alpha filter (using Pixel math in Maxim DL). The R' is a 70% red and 30% H-alpha image. The resultant L'R'GB with layered (in Photoshop) with an H-alpha image (about 30% H-alpha contribution). Imaged with CCDAutoPilot II, calibrated and registered with MIRA AP 7.0, deconvolution with AIP and processed Maxim DL and Adobe Photoshop CS. Images obtained from 1/16/06-2/2/06, by KBQ. 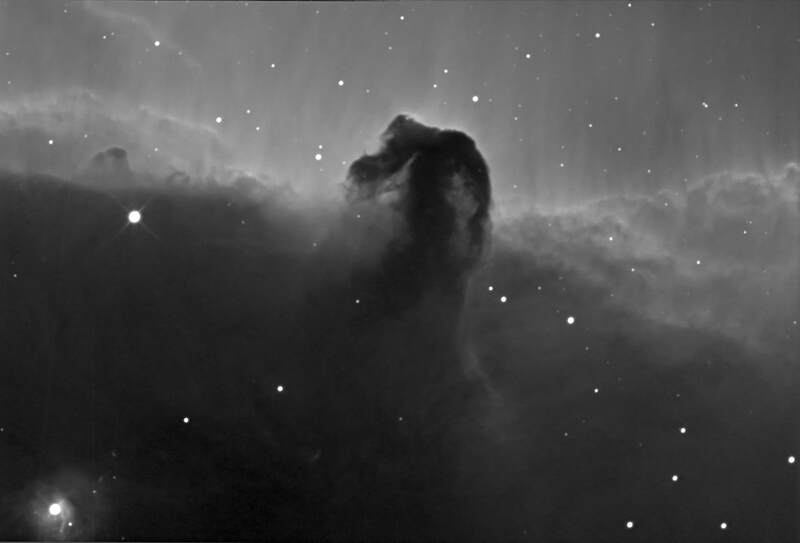 I'm sure everyone who's had a chance to image the Horsehead Nebula at a long focal length has felt the same excitement I did after processing this image. This is an absorption nebula in Orion. 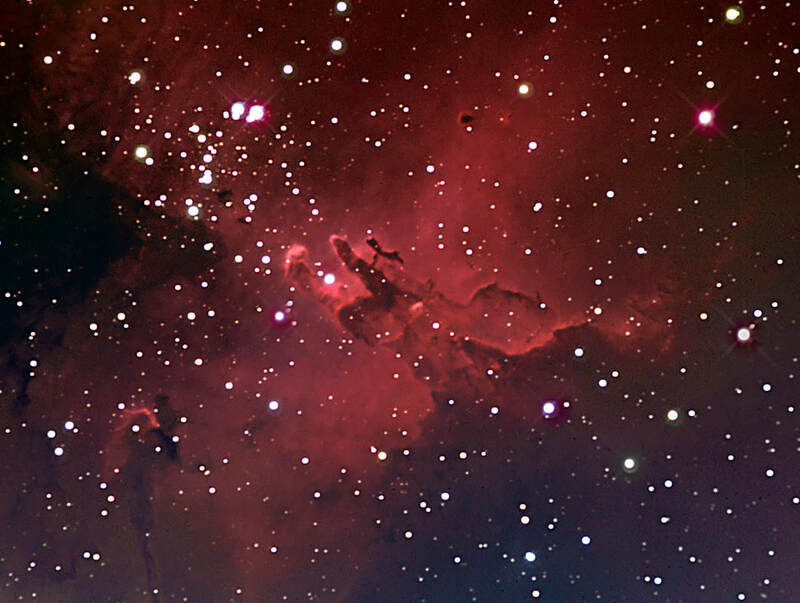 The associated emission nebula ( NGC 2023) can be seen in the lower left corner. 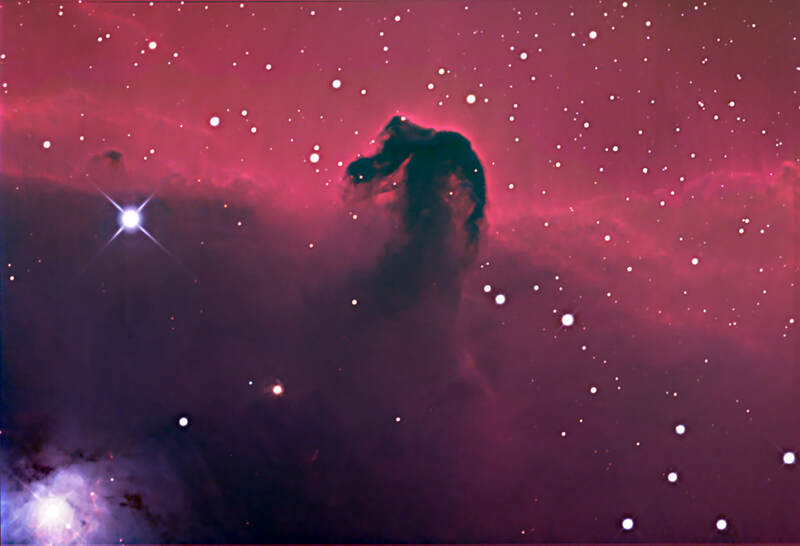 The horsehead-like image is about one light year in length. Then faint glow about the top of the nebula emanates from another nearby emission nebula (IC 434). I'm still working on the color composite image and will post it soon. Captured with an SBIG STL-6303 and the RCOS-16. Fourteen separate 15 minute exposures in H-alpha were processed for this image. Imaged with CCDAutoPilot II, calibrated and registered with MIRA AP 7.0 and processed with Adobe Photoshop CS. Images obtained from 2/4/06 - 2/10/06, by KBQ. This image, without a doubt, was one of the most challenging for me, from a processing point of view. I was definately pushing the limits of what I know (which is easy to do...), and all I can see are the imperfections. In my initial attempts I either lost the wispy details of the H-alpha image or ended up with the classic "salmon" colored image, whether I assembled the image as an H-alpha-LRGB or as an LR'GB (with the red and H-alpha channels merged). Finally I assembled an LR'GB which I merged with an H-alpha, using this as my composite image to merge with the LR'GB. This took some of the "salmon" color OUT of the "composit" image and allowed me to retain MOST (not all, darn !!) of the H-alpha details. The image is therefore a LR'GB + Ha-LR'GB image. I can't see straight after 6 hours of procesing, so hopefully its worth looking at. Imaged with an SBIG STL-6303 using CCD AutoPilot II. Twenty separate 15 minute exposures for each of the H-alpha, Red and Luminescence filters and 10 separate 15 minute exposures for the G and B filters. Total image time was thereefore 20 hours (another 15 hours worth was tossed). Imaged with CCDAutoPilot II, calibrated and registered with MIRA AP 7.0, deconvolution with AIP and processed Maxim DL and Adobe Photoshop CS. KBQ, Febuary 7-March 28, 2006. 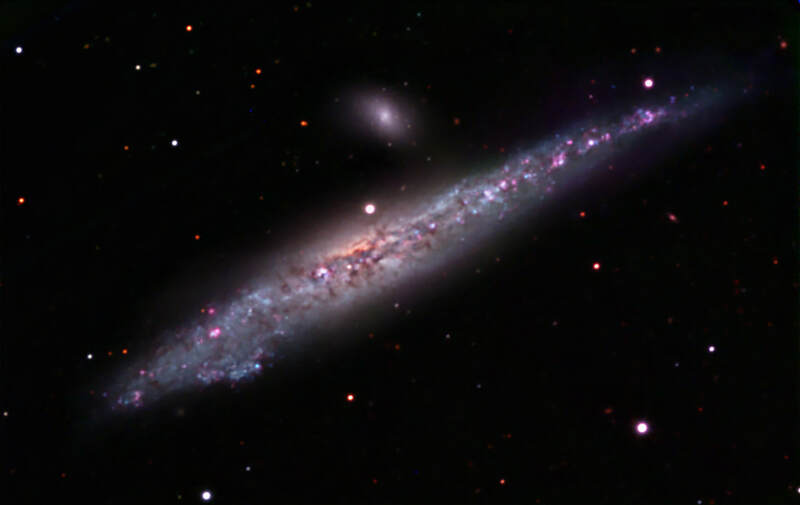 NGC 4631, also known as the Whale Galaxy, is a large edge-on spiral galaxy in Canes Venatici. The distortion is believed to be due to the campanion galaxy seen above. There even appears to be a connecting bridge of hydgrogen between the 2 galaxies. Imaged with an SBIG STL-6303 using CCD AutoPilot II. About twenty separate 15 minute exposures for each of the L, R.G,B filters obtained and processed as an LRGB image (25 hours of imaging time). Imaged with CCDAutoPilot II, calibrated and registered with MIRA AP 7.0, deconvolution with AIP and processed Maxim DL and Adobe Photoshop CS. High Pass filter used to bring out details of galaxy. KBQ, March 31 - April 11, 2006.